RFSoC: a technology for the times. For a world in which the only constant is change. Multiple devices combined into one. 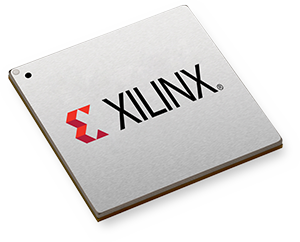 Xilinx’s Zynq® UltraScale+™ Radio Frequency System-on-Chip (RFSoC) family is a breakthrough architecture integrating the front end of the RF signal chain, enabling you to achieve a major step forward in performance and density - meaning fewer boards and much less power. Zynq RFSoCs combine analog data converters and/or SD-FEC cores with high performance programmable logic and ARM® multi-processing system to create a comprehensive analog-to-digital signal processing chain on a single monolithic device. These devices provide unrivaled levels of system performance, flexibility and scalability – all critical factors for next generation radar systems which typically have decades-long deployments. David Gamba, Xilinx Senior Director of the Aerospace and Defense Vertical Market. Lower latency, simpler RF processing, increased flexibility. Xilinx’s remarkable technology helps deliver the flexibility and performance needed for a wide range of commercial applications such as 5G wireless as well as defense applications such as cognitive electronic warfare and radar signal processing. Using very high sample rates in the data converter, as RFSoC devices do, means that much of the analog filtering and conditioning can be done closer to the antenna, providing a simpler, more flexible front end than has been possible in the past while also reducing latency. And - not only is the front end simpler; so too is application design. For 5G wireless - with its enormously increased requirement for bandwidth, data rates and network capacity - breakthrough technologies are required. RFSoC is such a technology. In defense, digital technology allows threats to quickly employ new techniques – requiring countermeasures to do the same. Leveraging an RFSoC device enables cognitive signal processing because of their adaptability and optimum balance between channel density, signal processing capabilities, and power consumption. Success on the modern battlefield increasingly depends on dominating the electromagnetic spectrum. State of the art RFSoC solutions from Abaco. The Abaco VP430 is the first 3U VPX COTS platform to leverage the multiple advantages and benefits of RFSoC technology. It is also one of the densest analog FPGA DSP boards available, with eight ADC (4.0GSPS) and eight DAC (6.4GSPS) synchronized channels, and features the ability to synchronize multiple boards for even larger system applications. The VP430 is a major step forward in performance and density, enabling the use of fewer boards and much less power while delivering increased processing throughput and very low latency. In fact, for comparable capability, it occupies one fourth of the slots that earlier generation solutions would require. Want to find about future RFSoC based products in additional form factors from Abaco? We’re proud to work with Xilinx and leverage their state of the art technology. The VP430 is a 3U OpenVPX payload module that employs Xilinx’s Zynq Ultrascale+ Radio Frequency System on Chip device to provide high-speed, low latency, Digital to Analog and Analog to Digital conversion. The RFSoC device accomplishes this by combining a Zynq US+ SoC/FPGA with eight ADC channels and eight DAC channels. Each ADC and DAC channel is capable of 4 Gs/s and 6.4 Gs/s, respectively. The VP430 module includes two 64-bit DDR4 interfaces capable of 2400 Mbit/s. Eight of the 16 GTY channels available on the device are used to support PCIe Gen2/3/4 over the subsystem’s backplane. The remaining 8 GTY are used to support Abaco’s proprietary sBLAST site. 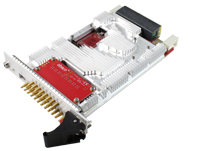 This flexible board-on-board form factor can support many forms of static and dynamic memory with its GPIO, or it can support fiber optics over backplane using Samtec’s Firefly™ line of transceiver modules.